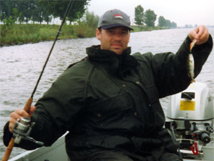 Since my first fishing trip to Holland with Michel Huigevoort in 2000 I have visited again 3 times, I've had no more spectacular fish but have definitely had some nice ones, and plenty of fun. Here are a few pictures from those trips, dates are hazy, but the stories are roughly accurate! The weather was not helpful, either bright and sunny or cloudy and raining with not much in between, takes were hard to get; personally I'd rather struggle in the sunshine than in the rain! 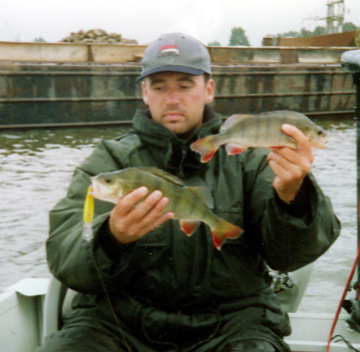 These perch were part of a shoal that stretched maybe 300m including some small ones, but most were around the 12oz to 1lb mark. The short time we enjoyed trolling back and forth through the shoal was the highlight of the trip, I wonder how many perch there were there. In September 2003 a small party of us went over to stay at the Beekse Bergen Holiday Park. Michel works there and arranged free accommodation for us in return for whatever publicity we could arrange through the LAS and PAC magazines (and this website). Beekse Bergen is near Tilburg, and is a large complex of self-catering chalets, camping and caravan sites, there is an amusement park and the usual facilities you would expect on such a park, including restaurant and supermarket. 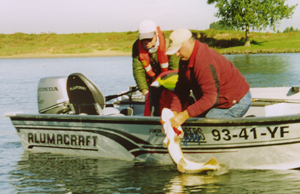 It is a lovely place, an excellent venue for a family holiday with a little fishing thrown in, you can hire 10ft Pioneer plastic boats which are essential if you wanted to seriously fish the lake for predators. We were staying in one of the spacious chalets on the side of the lake. The lake is a 70ha sandpit, it was a bit of an unknown quantity as a predator water although many carp and bream anglers visit it for the quality of the fishing. 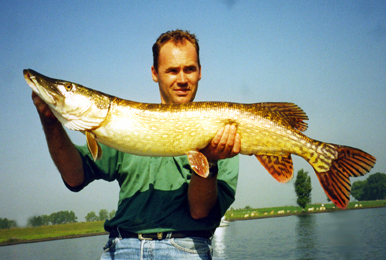 It is connected to the Wilhelmina canal so there is no reason for it not to contain a full complement of predators. Michel pointed out that most of the sandpits like this are much better winter venues. Our Holiday coincided with the hot autumn of 2003 that blessed the UK and western Europe, we had temperatures as high as 30ºC, it was more like Spain than Holland! There were 5 of us John Cahill, Phil Cooper, Chris and Steve Bielby, and myself; Michel worked out a shedule so that everyone got some time guided with him and his mate Adri, the rest of the time we would have to find our own sport. 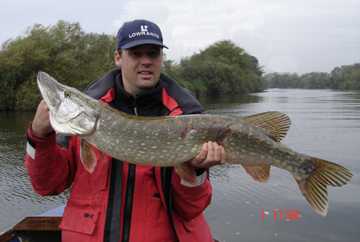 On one of my solo trips onto the lake I did manage a 98cm pike on a trolled Fatso from an area I'd identified the day before, on my first pass over an 8ft deep sparsely-weeded shelf adjacent to a dramatic drop-off into 35ft, I thought I was going to clean up, but didn't get another take. In the main the pit was hard going, a handful of perch and jacks, and one zander. 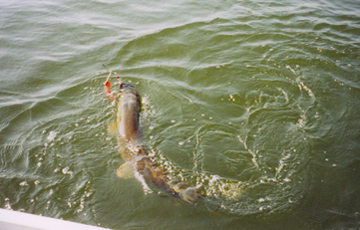 It was not exactly easy to fish, about half of it was over 40ft deep, down to	about 70ft (I remember), there were many carp anglers and they had lines all over the place, just because you couldn't see one didn't mean there wasn't a line there, they were rowing baits out in little inflatables, sometimes 200m or more from where they were seated. 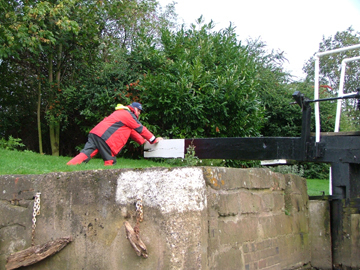 A significant section of the shallower part of the pit was effectively unfishable because of this. Phil managed an 18lb carp though, and a good bream. A party of 4 Belgian anglers caught loads of quality bream over 4 days by appropriate groundbaiting and keeping it topped up with feeders - they caught a lot of bream, and drank a lot of beer! Not sure if they caught more bream than they drank cans of beer, but they were laughing and joking the whole time. 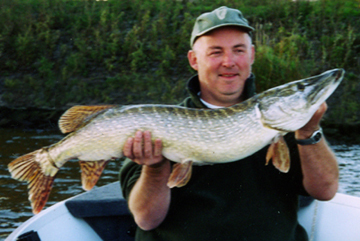 I had a Sunday afternoon trip with Michel that resulted in him getting two nice pike to 108cm, and me getting one of 93cm, we had a couple of perch as well - all trolled. It was a Sunday afternoon, the Maas was quieter than usual in terms of commercial traffic i.e. not so many	ships; however, half of the nation was out on the water enjoying the sunshine in various forms of watercraft: sailing yachts of all sizes, pleasure cruisers, jetskis and anything that would float, notably a small RIB with an unfeasibly large outboard was tearing up and down and	between all the other stuff, aboard it were 6 children up to about 14 years old with not a life jacket between them! Everyone was happy, it was a sort of laid-back madness. No landing net on Michel's boat, so we wait for the fish to be ready, then it is quickly lifted out and unhooked, finally held aloft for a great trophy shot! The blue sky says it all about the incredible weather. 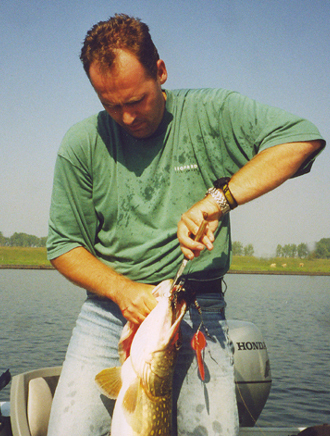 One day was spent at Dordrecht at a well-known zander fishing area, I believe they hold competitions there. This was a real eye-opener for me - powerful currents, deep water, big ships of a completely different order of magnitude to the usual Maas traffic and we had some spectacular weather - a near gale later in the day. It was a jigging day, John Cahill and me with Michel while Chris and Steve Bielby accompanied Adri. I had a really bad day, just off-form, fished badly and had a zander and perch when I was messing around with a bottom bouncer, but Michel had several perch and zander, John had some zander and on the other boat Chris had 9 zander, with Steve and Adri getting several as well. Phil's 103 goes airborne! But Adri soon gets to grips with the situation. 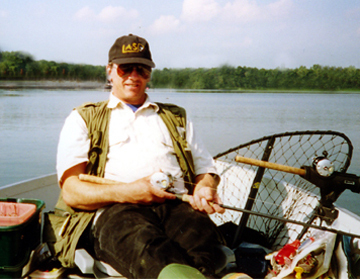 John in action with a lively fish. 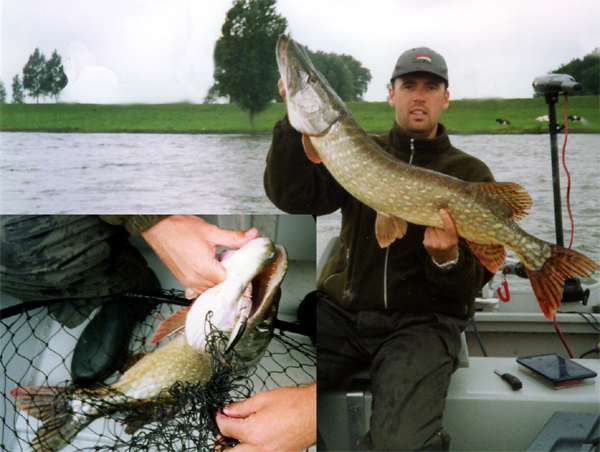 In February 2004 I had a solo trip to catch the end of the Dutch pike season and found the going very tough, the weather was very cold, not quite freezing with daytime maxima of 3-4ºC, with rain and snow at times as well. 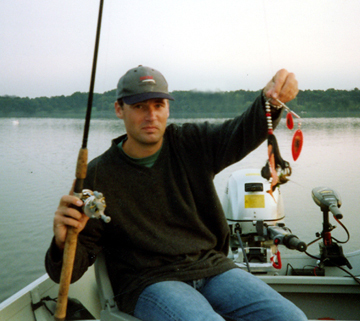 But to Michel's great credit we caught every day, not a lot, but we caught. He gave me quite a lesson in zander jigging though getting 5 fish to my 1 while I tried to figure out what I was doing wrong, but it has stuck and helped me since. The highlight of the trip was this p.b. 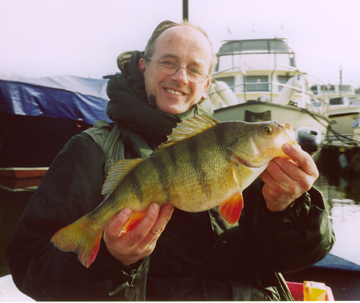 perch for me, not weighed but 43cm long, easily over 3lb I'd have thought. We had been trolling a noted perch hotspot and	Michel had a pike and lost a perch, we stopped for a sandwich and I cast my Bomber B24 Long A, amazed to get a take, the only one I had all day. 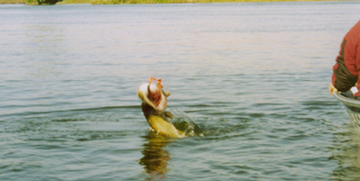 Shows the value of keeping a lure in the water! 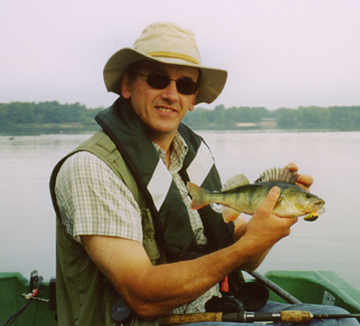 In September 2004 Michel came over to stay with me for a few days' English fishing. It	was his first visit to England, he was quite taken by some of the scenery, very like Ireland (this is rural Worcestershire). As it turned out we had good fishing and weather. 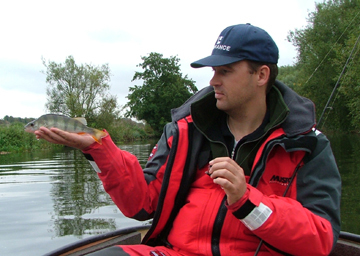 We had one day on the Avon and we caught it just right and had loads of small pike - I even had a double, we lost count but had at least 25 between us with as many follows and takes again, a few perch also showed up and Michel had a small chub, a new species for him. That was a real fun day. 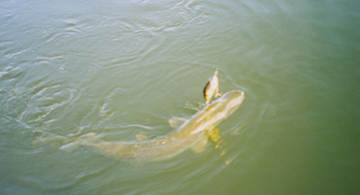 Three days on the Severn showed Michel what a capricious river it can be as it cleared	after being coloured by rain, it produced a few doubles and on our last day at its clearest one 'metersnoek' for Michel, I was so pleased, I owe him a few of those! It was a damaged fish, the biggest of 3 in similar condition from the same spot. We also jigged for zander, and caught some, I've sussed a little location trick for them and Michel was quite impressed - something he did not know - he still beat me taking 9 of the 15 zeds we caught, but since I was busy trying to maintain very precise control of the boat and Michel is very good with a jigging rod I think I did pretty well. More visits are planned, long may Anglo-Dutch relations continue to thrive!